In Cambodia people catch and release birds to celebrate religious holidays. I live in Phnom Penh fairly close to the Tonle Sap river, and down in a pagoda by that river there’s been a ceremony going on. 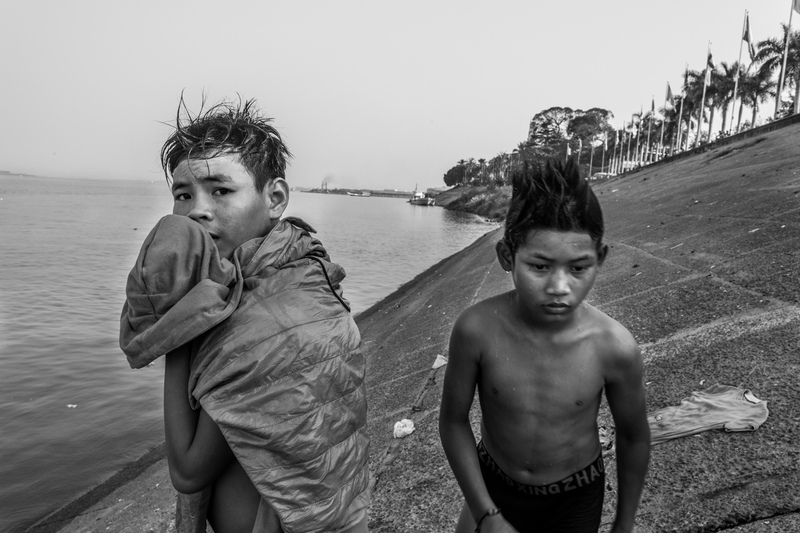 Boys who’ve recently finished bathing in the Tonle Sap river. 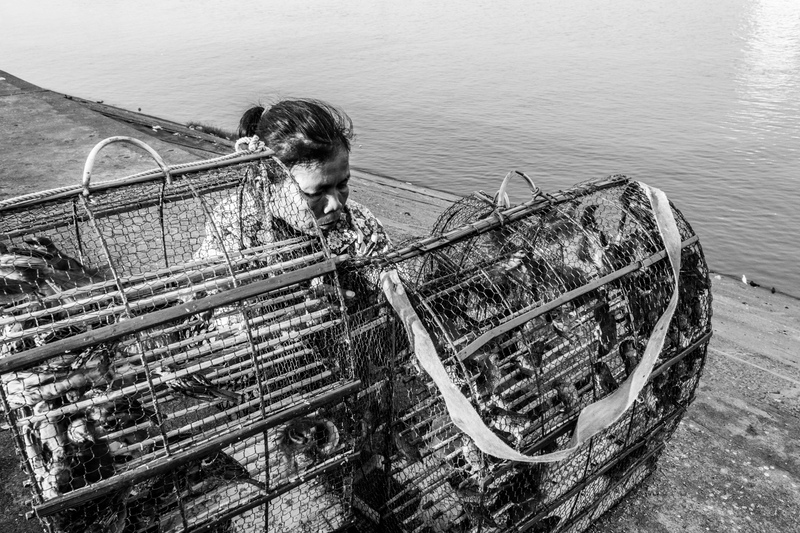 Woman cleaning bird cages by the Tonle Sap river. These birds are caught and repeatedly released. The Tonle Sap is magical river. Around the end of the rainy season the river entirely changes direction. If you go stand along the banks you’ll see masses of aquatic vegetation flowing downstream — they were torn up as the water switched course. 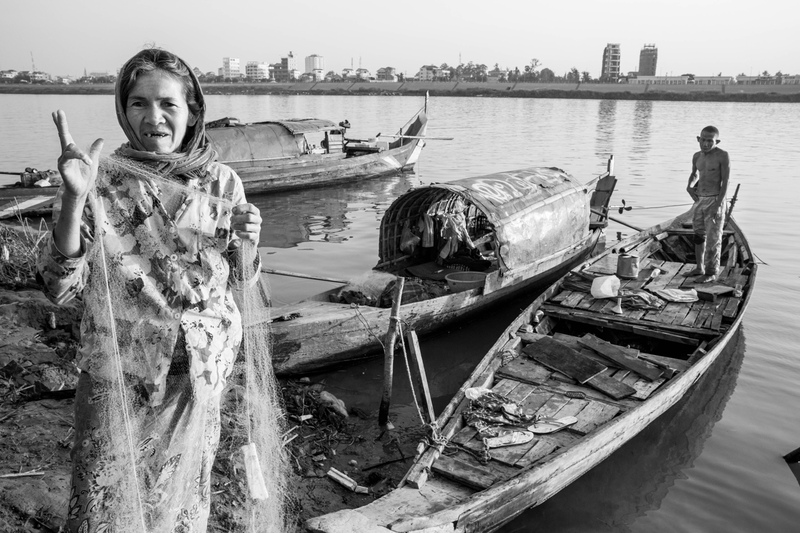 A woman and her husband showing me their fishing nets and boats by the Tonle Sap River. Cambodians celebrate the changing of the river’s flow with an annual water festival. What’s important to understand is that this isn’t a bunch of simple people worshipping an aquatic force. Having watched it and learned about it, I’d probably be worship the Tonle Sap too. 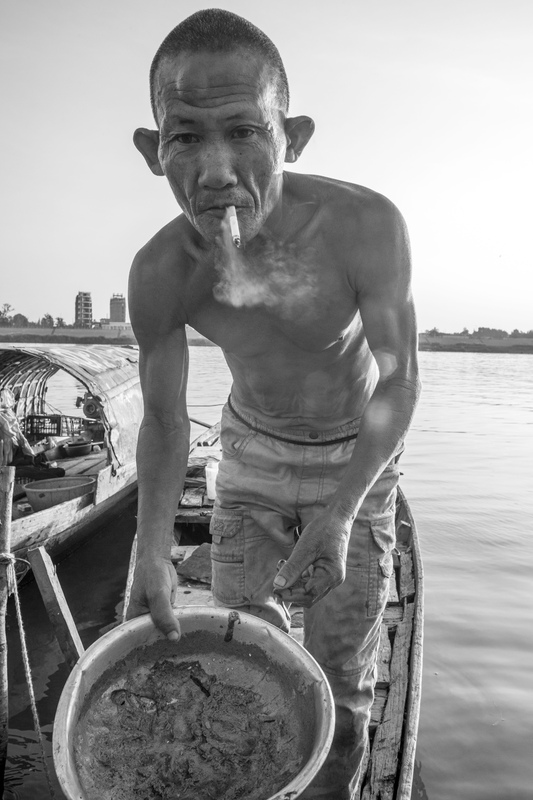 A man showing me how he uses collected chewing gum to patch holes in his boat on the Tonle Sap river. As the rainy season overwhelms the Tonle Sap river it flows north and fills Tonle Sap lake near Siem Reap. Wikipedia says that the lake fills from one meter deep to nine meters deep. I’ve seen this with my own eyes. Back in may I visited the Kompong Khleang floating village near Siem Reap. At the time the water was so low that our tour was was given in a small longtail boat which frequently ran aground. In December I went back to Kompong Khleang and barely recognized the town at all. What had been an entire town, spanning many acres of land, was reduced to a small isthmus jetting out into the lake. My motorbike bounced along the dusty road. Crowds of people gathered to see me go by, alternating between signing happy children screaming “alo” in French and older adults viewing me skeptically. The Tonle Sap Lake fills up so much in the rainy season and empties so much in the dry season that it leaves behind a massive patch of well fertilized land. This fertile land was the driving force behind the Angkor civilization and Angkor Wat. 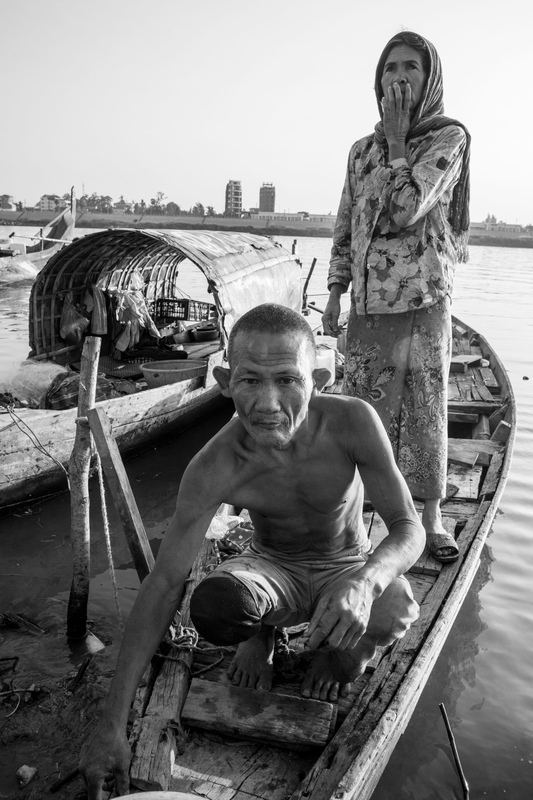 The same couple and their two boats on the Tonle Sap. I try to keep this in mind when I’m down on the river watching all the mystery happening. Boys kicking off their clothes to swim naked in the water, women carrying huge cages full of birds, shirtless men crawling into the water with nets and well dressed men standing on the short with fishing rods. There’s a skeptical side of expats in Cambodia to think that the Khmer people are lazy or incompetent. I live here, I interact with Khmer people every day, and it’s a hard impression to shake. What I try to think of now is that the Cambodian civilization is the perfect civilization to interact with this river. Seventy percent of their protein comes from the river, rich fertile land makes growing rice easy, and they do what I think I’d do myself if I lived on top of such a natural resource: relax often, pray to it, and not worry too much about the future.